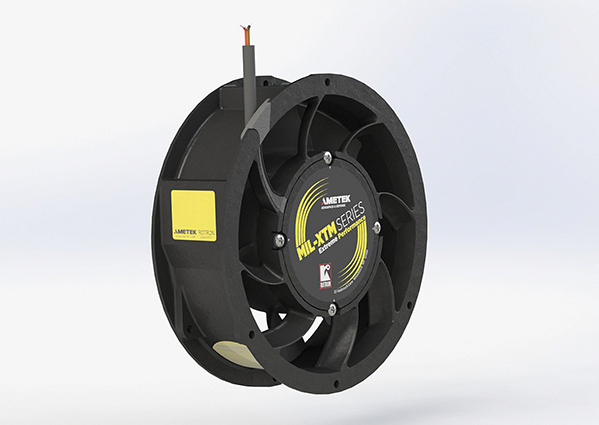 WOODSTOCK, NY, USA -- AMETEK Rotron (www.rotron.com) has introduced a high output version of its MIL-XTM Tubeaxial Fan that is optimized for heat sink and heat exchanger electronic cooling applications. This addition to the Extreme Performance Series delivers best-in-class capacity of 450 cfm @ 1" iwg or 350 cfm @ 2" iwg. It is designed for long life in harsh military, aerospace and industrial environments. The new fans can be used to cool electronic devices and equipment racks in mission and personnel critical airborne, land-based and sea-borne applications. Multiple fans can be stacked to meet high-flow requirements. Standard efficiency and reliability features include advanced composite propeller material, shock-proof construction (meeting Mil-S-901), reverse polarity protection and over-voltage protection. Optional features allow the fans to be used in a wide range of situations and configurations. These include round or flat case, mounting options, EMI filter, immersion protection, fan performance sensor, analog speed control, custom finishes and more. AMETEK Rotron is a division of AMETEK, Inc., a leading global manufacturer of electronic instruments and electromechanical devices with annual sales of US$4.0 billion.